A recent report by Sensor Tower revealed the list of most downloaded apps in the U.S. during the Q1 2019. The top 10 downloaded apps overall, along with the top 10 on the App Store and Google Play Store are mentioned in the ranking. According to Sensor Tower data, TikTok was the most popular app which had over 13 million downloads in the Q1 2019, 184% more downloads than Q1 2018. Instagram is on the second number with more than 10 million downloads in the US, followed by Facebook, Snapchat and Pinterest. These downloads have been recorded during the time frame of 1st January 2019 to March 31, 2019, and does not include the pre-installed apps from Google or Apple app stores. Downloads from the third-party stores are also excluded, whereas the apps version aggregate is part of the figure, such as Facebook and Facebook Lite. TikTok and Instagram has been struggling to surpass the number of downloads more than the other. On the App Store, Instagram has been on the top, whereas TikTok is on the 2nd position. Facebook comes third, whereas Snapchat and Pinterest are also among the top 5 downloaded apps on iOS devices. Also read: Facebook, Snapchat, Instagram or Twitter: What Social Media Platforms do Teenagers Prefer? The place of Facebook, Snapchat, and Pinterest on the list is 3rd, 4th, and 5th, which is the same on all the three lists given. 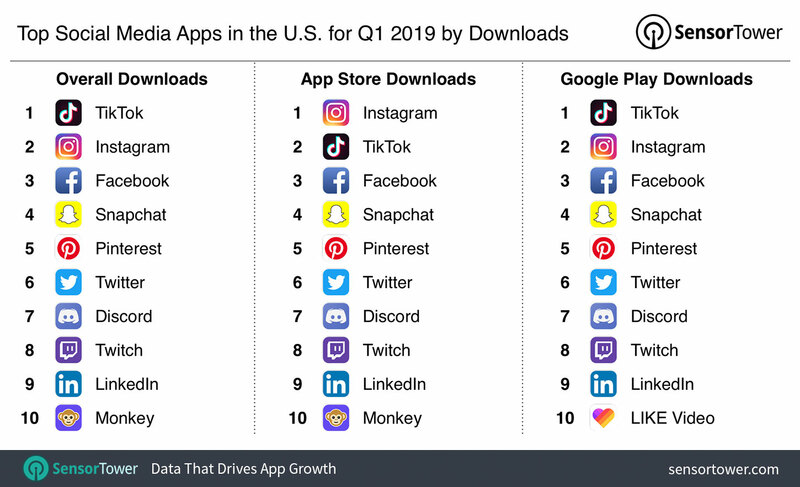 Whereas on Google Play, TikTok is leading and Instagram comes second on the list of top downloaded Apps in the US during the Q1 2019.